Costa Rican Ramblings: Another Birthday? The day after Jordan's birthday, she's still celebrating! 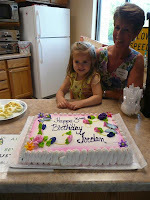 While visiting another church, Jordan was presented another birthday cake!